I’ve been brainstorming what to cook up to for a friend’s upcoming Christmas do and wanted a relatively simple starter that wouldn’t become soggy and require the fuss of reheating on arrival. A block of Terrine, lovely cold or at room temperature seemed to the fit the bill well. 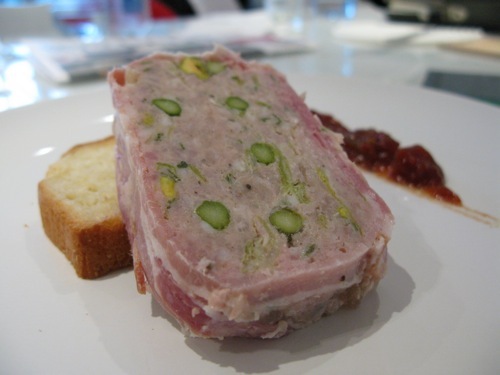 As much as I love Terrines and have always been drawn to them when they appear on the menu, it’s not something that’s ever crossed my mind to home-make before. The truth is if you have a bread loaf tin in your store cupboard at home, its incredibly easy and good fun to make. 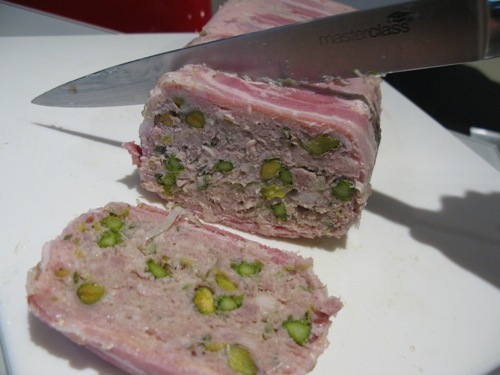 Here’s my first take on Terrine, adapted from a James Martin recipe. Pre-heat your oven to 180°C and brush the loaf tin all around with some olive oil. Line the base and sides of the tin with the streaky bacon, leaving 5-6cm hanging over each side of the tin to wrap the base later. In a large mixing bowl, mix together the sausage meat, minced pork, pistachio, egg, sage leaves and leek. Season with the all-spice, nutmeg, salt & pepper. Fill the tin 1/3 of the way up with the pork mixture. Arrange half the Asparagus tips lengthways into the mixture. Repeat the process for the 2nd layer, then fill the tin to the top with the mixture, then parcel the package up with the excess bacon. Wrap the top of loaf tin tightly with foil and place into a deep oven dish. Make a bain-marie by filling with hot water to about halfway up the tin. Bake for 1 hour in the oven. Once done, leave to cool for 15-20 minutes and pour off any excess fat. Wrap the top with cling film and refrigerate overnight, weighing the top of the tin down with some soup cans to shape the terrine back into the mould. Cut into thick slabs, and serve with toasted Brioche and some Tomato chutney. Dee-licious, if I may say so myself =P.